Candy Kraft Candies is home to the famous Peanut Butter Filled Ribbon Candy and other flavors of Ribbon Candy as well. Our Candy Store is full of Old Fashioned and hard to find candies mixed in with hundreds of everyone's favorite chocolates and nuts. We also sell Turkey Joints, nostalgic items and have many of the newest sweet products. We hand-make filled Chocolates, Mints, Truffles, Hard Candy, Fudge, Jellies, Creams, Peanut Butter Ribbon Candy and more. Visit Our Candy Selection for a taste of what we offer. We will be happy to answer any questions or take your order by email. If you would like to order via PayPal; please email your order and shipping address along with any special instuctions and we will send you a PayPal invoice. Candy Kraft first opened its doors in 1935 and now, 84 years later, and over 35 years with the current owner, we're still pleasing our customers with excellent Chocolates, Candy and Customer Service. We cannot guarantee that your order will arrive without melting when the temperature outside is higher than 80* (here, there or anywhere in between) Please consider an item that isn't temperature sensitive when sending candy during warmer months and climates. Cream Filberts - remember these candies? We make them right here! 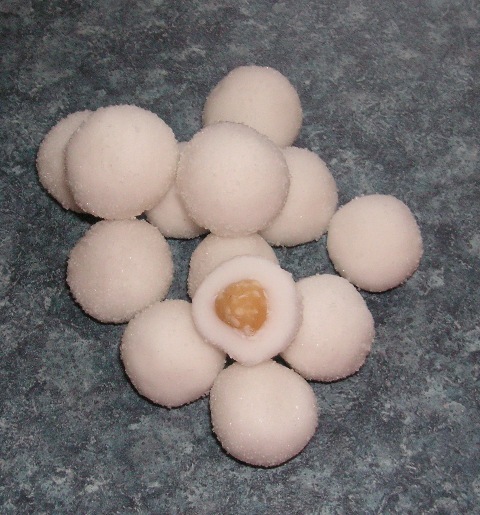 You can call them mothballs or snowballs we'll know what you mean when you call to order these hard to find candies.